It has been a long time in the making but the 2nd Digital Cookbook from Bijouxs here here and ready for download. It's plant-based recipes are lovingly photographed in my heritage garden I loved for some many years. 24 recipes, all perfectly portable in the digital format, travels well. With a perfect price, just about the price of the latte. From time to time, my photographs are featured on different websites. Here is a little jewel that was recently featured on Gardenista. Enjoy! The Pasadena Magazine feature contains recipes from my upcoming digital cookbook, Bijouxs Family and Friends, the first in a series of little jewel volumes. May and June are always calendared with celebratory events and this family-friendly menu is one I often serve in the summer when dining casually on our well-weathered picnic table. It includes favorites from Bijouxs.com, such as super-fresh Provençal Cocktail and Fresh Blueberry Pielets, along with exclusive recipes from the Family & Friends digital cookbook. (Pictured above, Santa Maria Style Steak Salad with Cheesy Crusted Potatoes). Pasadena Magazine May/June issue is on availble online. Welcome! I have put the finishing polish and shine on my first ever Bijouxs Little Jewel Cookbook! Yay! This first little cookbook is titled, Family & Friends, with 30 of the most requested recipes from the Bijouxs kitchen, plus 10 new recipes exclusive to this book. The book is one sale now, at my online shop. The cookbook is a true independent project, a labor of love. I wrote, styled, photographed, designed and did the layout of the book. I felt it was the best way I could begin to bring my vision of the Bijouxs Little Jewels Cookbook series forward: small, intimate little gems, accessible recipes framed by a personal connection and visual point of view. This first offering is a digital format (more about that later). There were considerations that were important to me while I was designing the book. First, the decision to include a photograph for each recipe of the the completed dish. It seems that the one recipe I want to try in a new cookbook is the one where there is no photograph. Being a visually-driven diner, I like to see what to expect in a completed recipe. Second, the images in the book are of the actual food as I prepared it, no food styling tricks, just straight up images of the recipes, sometimes plated on my personal serve ware or other times captured simply, still in their cooking vessels. Lastly, an important hallmark of my Bijouxs project is to capture the everyday beauty all around us, right here in our kitchens, the kind of simple beauty I see as I prepare food daily. Here are a few images to give you a peek into the cookbook. The Bijouxs Family and Friends eCookbook is ready for your cooking pleasure, with two more books in the works. Thank you to my family, friends and lovely readers for being a part of Bijouxs Little Jewels from the kitchen and for your continuing support! 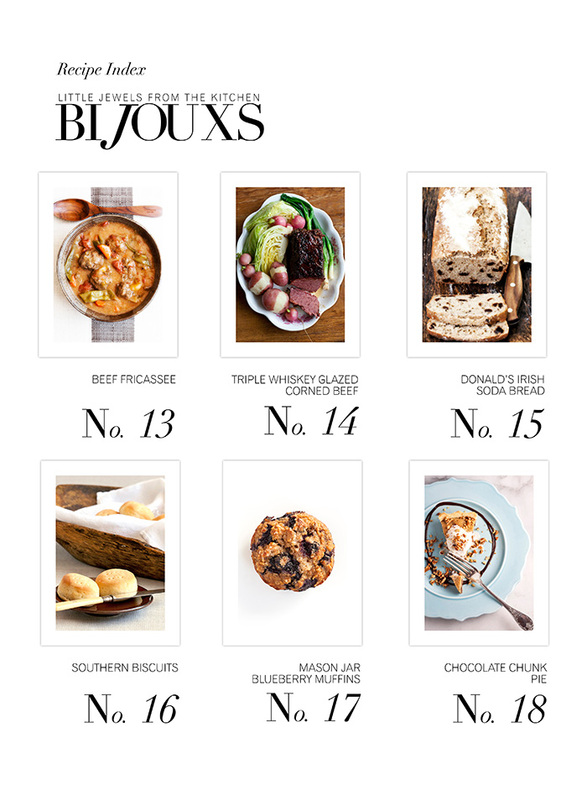 The Bijouxs Digital Recipe Collection is on the way! The lightening fast developments in digital publishing keep designers on their toes. I began development of the Bijouxs Digital Recipe Collection last spring, as Adobe was launching it's new DPS platform. Less than a year later, DPS is getting its legs. I am really looking forward to getting this project out soon and launching more projects of this kind for the iPad.